Almost twenty years ago, I ate a meal consisting wholly of lentils and vegetables at my friend Cheryl's house. I use the term ate rather loosely since I mostly pushed the food around on my plate, swallowed a few of the veggies without chewing, and fed many to a curmudgeonly Schnauzer ironically named Happy. I didn't know much at ten years old but I knew that I wasn't a fan of Cheryl's mom's vegetarian meals. Oh, and I also knew I was on the cutting edge of fashion, rocking tie-dyed tights and a denim jacket that I'd bedazzled the living daylights out of. Not much has changed. Give me a plate of lentils and veggies and I'm sure my hunger will just magically disappear. I don't have a problem with veggies as a side but as a main course? Like I said, not hungry. I blame my parents for this mindset. See, I grew up in a primarily carnivorous house. I wasn't even aware of the notion of vegetable side dishes until I saw the trays of steamed, limp broccoli and cauliflower in the dorm cafeteria. Shocking, but that didn't trigger a sudden desire to eat more vegetables. And then a couple of days ago, I took one of those online magazine quizzes that asks random questions about your eating habits. How many times a week do you eat sweets? Um, a lot. How many servings of vegetables do you eat a day? Um, not a lot. What is your favorite vegetable? Favorite or one I despise the least? Needless to say, it wasn't pretty. The magazine said I would keel over and die from lack of greens in my system. Oh, and I likely had scurvy. Something had to change. I needed to make a meal with vegetables. And then, I decided to go for broke and make it a meal with vegetables and lentils. Trouble was, I had no idea what to make. So I typed recipe + vegetables + lentils into Google. Because when in doubt, one must turn to Google. Or their mom. But I was still holding mine accountable for raising me without vegetables (but man, such deliciously awesome meat dishes) so Google it was. And Google said... lentil soup. That sounded harmless enough. I like soup. Clam chowder. Cream of mushroom. Lobster bisque. And suddenly, I found myself Googling recipes for even more cream-based soups. Like I said, I have trouble with focusing sometimes. I forced myself to focus on lentil soup again. A quick Google search yielded no less than thirty varieties of lentils. I looked in my pantry and saw a nondescript bag of lentils. A Cook's Thesaurus told me they were either brown lentils or masoor. In any case, I had no idea where they were from or how long they'd been sitting there. In other words, they were perfect. The veggies weren't too disconcerting. Plus, they'd be cooked into oblivion and then pureed so I could handle that. I had the rest of the ingredients so I was good to go. Except well, I used turkey stock instead of the veggie stock. Because I couldn't give up the whole meat thing cold turkey. Heh. 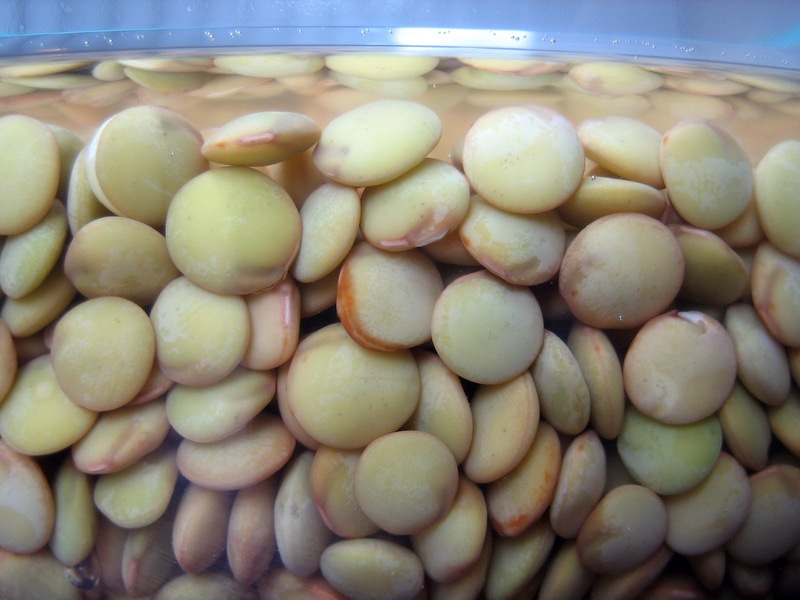 Rinse lentils and soak in water, preferably overnight. Heat oil in a stock pot. 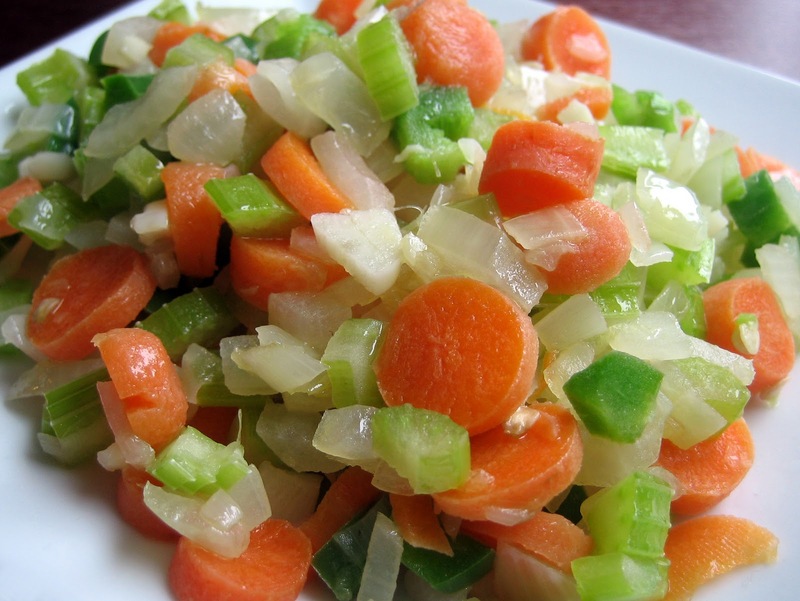 When oil is hot, saute onions, celery, and carrots. When vegetables are almost soft, add garlic and saute until garlic is fragrant. Drain lentils and add them to the vegetables. Add tomato puree and stock and let the entire mixture come to a boil. Lower heat, add cumin and coriander, and mix well. Cook covered for 45 minutes to 1 hour until lentils are soft. Taste the soup and adjust seasonings. At this point, you'll have a delicious, chunky lentil soup. I prefer mine to have a smoother consistency so I pureed half the mixture and added it back to the pot and cooked it for another fifteen minutes. Drizzle with Greek yogurt, or top with fresh chives, or even sharp cheddar. Definitely serve with garlic toast. Fellow vegetable-eschewer here! Lentils (braised and then sauteed with veggies) has been my gateway into eating more. Get the French green/blue lentils--they are really delicious, don't turn to mush when cooked, and are cheap when you find them in the bulk bin. I never thought to add in tomatoes to a lentil soup--I'll have to give this a try. Glad you liked it, I love lentil soup myself. This looks very nice. So happy you liked the soup :) I didn't like stuff like this growing up, but last year I started eating healthier and now I LOVE it. I think my husband is starting to come around too... Not totally on board, but hopefully getting there. It is actually pretty filling right? it's the Pakistani in us that makes us shudder at the thought of a solely vegetarian meal. I can do the vegetarian thing for a few days, but my husb, forget it! I love your lentil soup, cumin also adds great flavor! My MIL told me that Pakistani people automatically assume you are cheap if you try to serve anything non-meat, so it's no wonder you had very few veggies growing up! My mom is not only "white" but she's also been a vegetarian since she was 10. It's no wonder I'm a very confused human being, right? I love lentil soup! And thank you for admitting that you too got a bit caught up in the bedazzing craze. I feel a bit better about my own fashion transgressions! Bravo to you! I'm actually a lentil fan although a died-in-the-wool carnivore. If you venture into lentil world again, go look at the Curried Lentil Soup that Bon Appetit had in their magazine last week. It was very, very good. I'm new to the world of lentils too. I started cooking when I moved out a few years ago, mostly because they're cheap. I was very surprised to discover I liked them. My only tip is to stay away from green lentils. They turn to mush; it's unpleasant. This soup sounds really tasty. I'll try it soon. I grew up in a meat eating household, but to this day I still have difficulties eating meat. I'm on the same "confused" train as Ameena. Your soup is the perfect vegetarian (changed to veggie broth) comfort food on a chilly, rainy day like today. Great presentation as well. Looks and sounds lovely, Azmina. This soup looks totally yum.Black lentils are my fav.You are a cute girl..you adapted the most desi thing from food network..soo cute.I cant stop smiling.I also get such highs after reading magazines & then I binge on fruits & veggies because thats hard when I live with a guy who is a carnivore in all sense of the word. On the list to make. Veggie meals can definitely be filling and satisfying. I love lentil soup made with 365 chicken stock, so good. And when in doubt add sriracha! Glad you're a lentil lover now after all these years. Oh this post cracked me up! I grew up staunchly picking off offending vegetables I didn't like from my food, and mum never stopped me. But I've grown into someone who LOVES vegs and lentils (and meat), so there's hope yet ;) We had lentil salad for dinner today (aided with bits of hidden chorizo, very good). 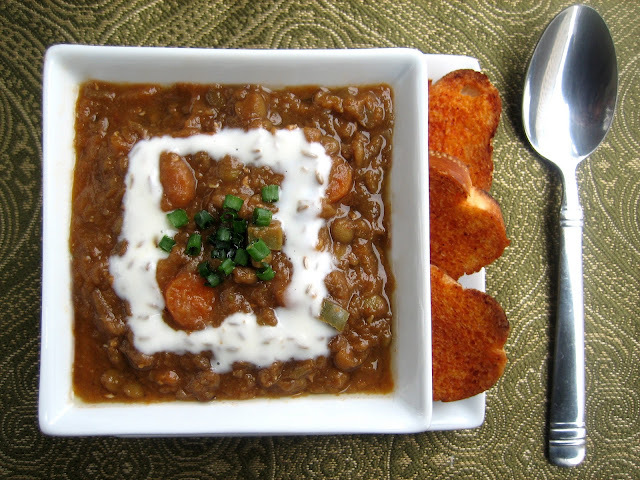 This lentil soup sounds like the perfect dish to start your pulses and vegetable journey on. this looks yummy!! in case your dominant carnivore side needs meat in this, i like to put a little bit of bacon in my lentil soup - makes a nice smoky and salty background. 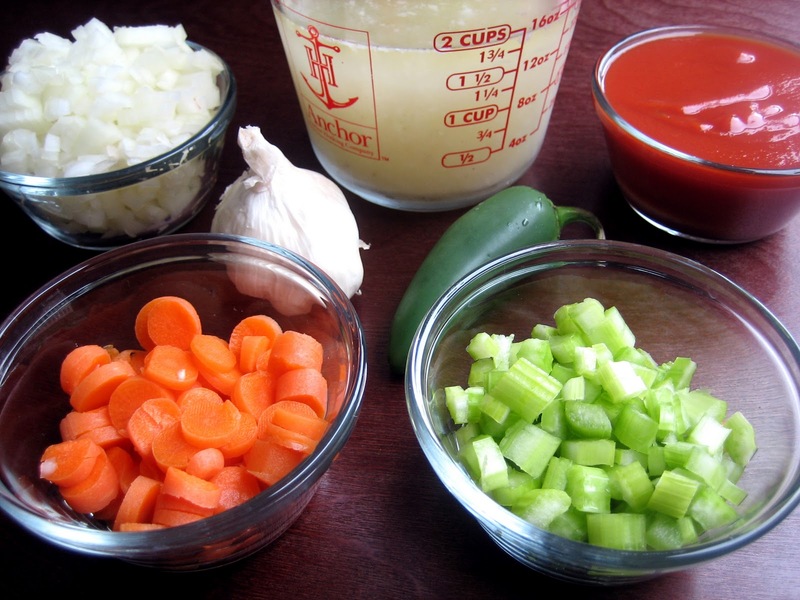 We make a lentil soup soup with loads of garlic and a little spaghetti sauce. Yours sounds yummy too. Haha... I'm a veggie Queen but I wouldn;t want to see the results if my husband took that quiz. I wonder if I could get him to eat your yummy lentils and veggies? i love lentil soup. garlic gives great flavor to it. i can never eat a whole clove. but need to have it in almost everything. you are amazing at taking pictures. the colors in the second pic look awesome! That's so funny. If you told me 20 years ago that I would end up loving lentils and eating them willingly 2 or 3 times a week I would have given you my signature eye roll and died laughing. also, check out my lentil burgers with Smoked Gouda recipe on my blog, Simply Healthy Family. It's my moms signature recipe and sooo easy and good! I may eat and devour all the lovely cuisines in the world but I know in my heart I love my Dal and chawal (now quinoa, since I have given up rice). The husband and I feel an emptiness in our meals if Lentils are not present. I cannot get enough soup this season, and this looks like one I should definitely try! Absolutely delicious recipe. Thanks for sharing! Well, I think you know how much I adore vegetables and I too grew up in a meat-filled household. But I think my love of veggies is actually an act of rebellion against my parents. because it still, to this day, irritates them to no end. This soup looks delicious and with all that flavor and spice...the meat can't possibly be missed. Looks delicious! I've recently discovered that I actually like lentils, so I'll make sure this soup is on the cards when I get back to London! I think part of the problem is lentils never look good. But I recently tried a delicious lentil concoction, so now I'm a fan. I'll have to try yours. Funny we should post a lentil soup recipe the same week! Mine is far from vegetarian- bacon, veal stock, chicken stock...but this sounds lovely and lighter. And don't stress too much about eating habits- you cook your own food- that is half the battle. Funny post, as always! i love the sound of this dish. it sounds so good right now..thanks for sharing this. I am still trying to convince my family that lentils are good. I have managed to hide them in "sloppy lentils" "lentil stroganof" "sweet and sour lentils" and the ambiguous "lentil casserole." Lentil soup is always met with the best reactions. A hearty lentil or bean soup can usually satisfy me as meat would. Glad it worked out for you! I like lentils, sometimes. Mostly the red ones. I think they taste different. I make them into snobby joes. But yeah, I have a hard time keeping the bacon out of vegetarian dishes. Ok, True Story. I was showing my students a clip of Masterchef and GUESS WHO I SAW???? But I jumped up and down and said, "I met her!" And they thought I was cool. So thanks for that. We had a lot of meatless meals, but they were mostly carbs, as in pasta, and more pasta:) Serbs are also very famous for being thoroughly carnivorous, and our family was a "black sheep". But I have never had lentils until I arrived to the U.S. I am going to make this next week. Seriously. Super amazing (or so it looks)!! i havent met anyone yet who hated lentil soup, its so good! a couple people i knew were wary of it at first but i made them try it and now they're hooked. i love it really thick, almost stew like, similar to yours. its the only way i'll have my bean soups <3 looks fabulous! Hey, no reason why you can't bedazzle a jacket now and wear it with pride. Height of fashion, right? Besides, I think the 80s are making a recurrence - at least, my neon tights and shoulder pads would like to think so. Hi Azmina! I enjoyed this write up and love lentils! I was wondering, how did you make the garlic toasts?